My 19 S5 came with the 265/30/20 tires. I am really concern of this extreme low profile tires with pot holes potentially damage to the tires as well as the rims. Has anyone try to use a higher profile tires like 265-35-20? S5's standard wheels were 265/35/19. That would give you a little help. At 26.3", 265/30R20 are already taller than the stock 255/35R19 (26"). 265/35R20 will be 27.3"!!! If you want 35 profile tires, simply swap your wheel for the 19". I would if I could find some 19" oem wheels I like locally. I have the 19" and the side wall is still barely there, if you want a noticeable improvement in side wall thickness, you need to step down to 18". Waiting to use up my tires and then I'll be going to 18" wheels. I am afraid you may be correct. We purposefully got 18's on our A5 SB to avoid pothole problems. Honestly, they look pretty good. Can you post a photo of your car with the 18" wheel please? What size tires do you run on them? 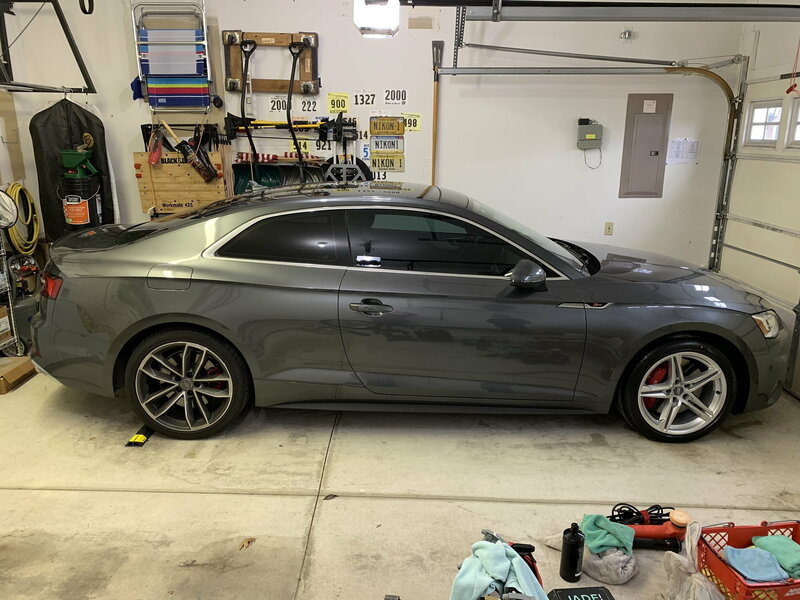 When I purchased my S5, I ordered the 19” Cavos — But they came with Summer Tires. One of our members was selling his 18” stock wheels w/All Season tires, which I purchased. That shot was just to show the difference between the 2 sets. Last edited by Nikon1; 04-17-2019 at 02:16 PM. Thanks. What size tires are on the 18"? Quick Reply: Different tire size? ?